Grandvewe Cheeses– a certified organic sheep cheesery located in Birchs Bay. The cheeses truly delicious, but the Vanilla Whey liqueur…ooo la laa! Holy smokes that was tasty. After a little rearranging of my hand luggage, a bottle of this delectable beauty was popped in. I’m a big fan of anything vanilla, but this took vanilla to another level. If you had told me before I had tasted it, I would be grasping a bottle of fermented sheep’s whey, (a by-product from cheese making) infused with vanilla bean… I would probably have cocked an eye brow and looked a little sceptical. Sold by the lovely James and his charming French companion, (whom I rudely forgot to ask his name). A bottle of this stuff would be worthy of either visiting the markets for, or stopping off at The Cheesery door. Great on ice cream, a dash in an espresso or just straight. My second stand out for the Farmers Markets was meeting and talking with Matthew Evans. *sigh* Yes I got to meet my idol. I managed to not turn in to a puddle of nerves…just, and would have happily grilled him with questions for the whole morning on all things rare breed, slow food, sustainable and Tasmanian living. However, at the risk of looking like a complete crazed stalker… I didn’t. I also didn’t get to taste any of his Rare Food free range piggy products as I had a plane to catch, (but they did look delicious). Looking over the products, reminded me of what bacon was supposed to look like. I can only imagine how it would taste. Matthew and his business partner Ross, use heritage breed pigs for their products, (at the moment Wessex Saddleback and Berkshire) and this week these same pigs would be fed a tasty diet of cherries, to enhance that delectable sweet meat on their ample bodies. So why am I a Mr Evans fan? Because watching his series, (and reading his blog) Gourmet Farmer gives me hope that one day my family and I can achieve something similar. A city person learning to do things from scratch. Anyone that is willing to swap a city life to one of rare breed rearing, artisan producing and taking a stand for what they believe in regarding what goes on a dinner plate…I have to applaud. This is the life I aspire to. 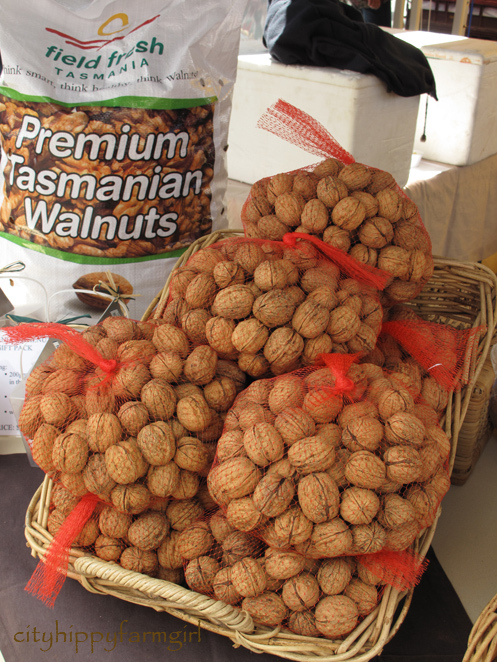 A life in the stunning Tasmanian countryside, peppered with some of the best food products in the country. Not a life of ease and convenience, but one of taste and ethics. Real food, that is simple, and yet complex and intricate on the palate. Real food that’s produced by that fella down the road or that lady over the hill. All enhanced by like minded people in a community setting that inspires others to strive to do what they feel passionate about. The fact that Matthew Evans and his fellow food producers seem to be doing this, inspires me. So for the moment, he will continue to be my ‘pin up’ Gourmet Farmer. As this lets me dream, of a land with hundreds of varieties of heirloom apples and free range heritage breed pigs when I am standing on a busy city intersection, waiting to cross and engulfed in car exhaust fumes. 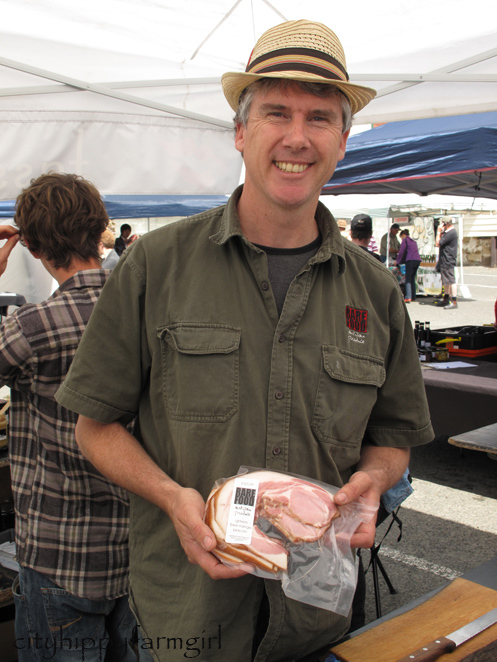 This entry was posted in Connecting with Community, Food Glorious Food and tagged Eating Locally, food, Grandvewe Cheese, heritage breed pigs, Hobart Farmers Markets, matthew Evans, Rare Food, slow food, sustainable living, Tasmania by cityhippyfarmgirl. Bookmark the permalink. Ooh, I’m so jealous of this trip! ESPECIALLY getting to meet Matthew Evans, I was glued to his series the first time they came out and now I’m enjoying introducing him to some of my family now that they’re replaying it. Joanna, I’m not sure. You could try contacting them via their website and asking? Whey, sugar, vanilla bean, alcohol of some sort? It’s definitely alcoholic, 17.5%. So packs a small punch. It’s not really like anything I’ve tried before… delicious though! I have not heard of Matthew Evans either. I’ll have to check him out. I eat cherries. I wonder if I would have sweet flesh. Sbs is currently running repeats on Thursday evenings at 8pm, for a couple more weeks. Then another series scheduled for later part of the year. …and you probably would have sweet meat. Lucky we are not caught in a snow storm and stuck on a mountain. I’ll bet you would love it there Sonya…less rain too. Brydie, all I can say here is….. you’ve gotta give wings to that dream of yours girl & fly. My little heart nearly broke for you as you so eloquently described your fantasy lifestyle on Tasmanian shores & then described how you must feel standing on that curb side breathing in the fumes of a city’s exhaled breath. Gourmet Farmer is a massively interesting series, didn’t know he had a blog, so thanks for sharing that. Some of my family have made a similar choice lifestyle too, so the realities of farm life (plus being raised in the country) makes visits to the family farm a reality for me (I’m the type that enjoys the farm visits, but don’t want to live there)…, but you my friend must do it. I do hope you can get to fulfil your dream but in the meantime…., thanks so much for being our intrepid reporter & bringing us more on your Hobart visit. What a wonderful little foodie vacation. We get our bacon from a local Amish farmer who does it all…It’s like a cross between bacon and ham…so lean and salty and tasty! How wonderful your bacon must taste. Enjoy every bit of it! I loved Matthew’s show too (watched via the internet because we don’t have TV). I just sat and watched and dreamed too. Though I think my dream is a bit more urban. You know what though? I think it’s a really good day for the world when a foodie-farmer is listed as a pin up instead of a sports person or hollywood starlet! 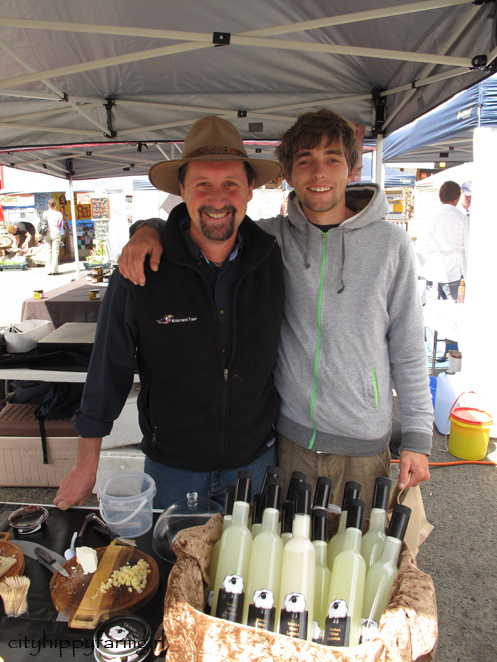 Go the foodie-farmer pin ups! Good luck as you move towards your dream Brydie. I totally agree Bee. I would much rather a foodie/farmer pinup then some wally famous for being famous. I think anyone that has watched Gourmet Farmer has loved it, which is wonderful. I second Joanna questions! The idea of making whey and vanilla into a potable drink is quite fascinating.! I love the rosemary and garlic and the walnuts and the bacon! I went to look at Matthew Evan’s blog. Tasmania is stunning Heidi. I’m sure you would love it. A foodies paradise. The Vanilla Whey Goodness, like I said to Joanna…not sure. The drink is quite simple in taste, so I would think there are not many ingredients. All it says is unfiltered sheep whey… It has to be tasted to believe how great it actually is! I have read his book 🙂 Great food tips at the end. Aaah, I’m so pleased to hear you got to meet Mr Evans! I remember how much you adore him. (Funnily, I was just chatting with someone today about him..). Sounds like a fabulous getaway. Christine, you’re so close! Maybe that camping expedition needs to go further south? A little boat ride and then weeks camping before school goes back? Oh so divine! Now I am off tomorrow to see if my local stocks that liqueur! All these blogs just make me so content living here – I LOVE Gourmet Farmer too! I am so excited that so many people are starting to change the way food is being produced. Down the South of Hobart is really growing fast with this new/old way of living. ps Did you get to take any garlic back? No garlic, all though I would dearly have loved to. It looked wonderful. Such a simple stall. 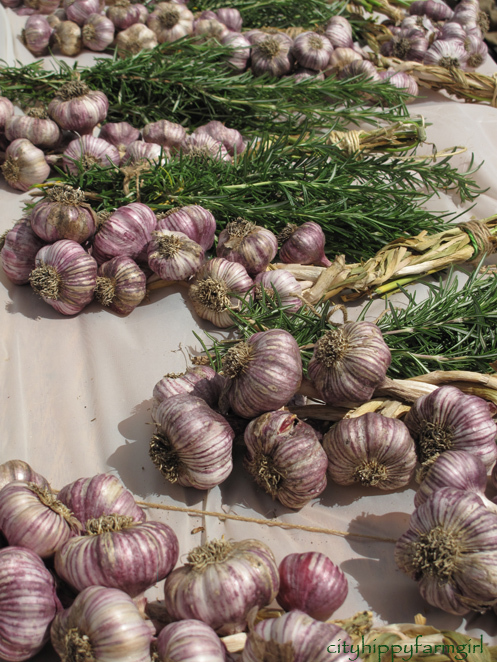 Garlic and rosemary. OOhh…lucky you! Hobart farmers market (look at that garlic!!) and Matthew Evans. Did you pack your bags with stinky cheese, garlic and more? I would have…. I would have dearly loved to. Oh I am so envious, that looks amazing!! I’m moving soon, and am finally going to be in the same town as a real farmer’s market … sooooo excited!! I hope your move goes well Alisa, and enjoy that Farmers’ market! What a great day you had. I can’t imagine having a farmers market in the month of January. So much fun! I am not familar with Matthew Evans so thanks for his blog link. I will check him out. Enjoy the whey. Thats the lucky thing about living here, lots of wonderful things in season through out the year. We are lucky in that regard. The whey is certainly being enjoyed. What a great idea Susan. Humm – that whey liqueur is quite interesting – here in the US, whey is almost a ‘throwaway’ byproduct of cheese making – most goes to hog feed. Fascinating to know that such a delicious drink can be made from it. I notice that they make no probiotic claims for it, but as a fermented whey product, it must have probiotic qualities – don’t you think? Wendy I would be very surprised if you didn’t adore the place. I loved that stall too, so simple. Just the rosemary and garlic, looking fantastic.